The report’s authors, Jill Pruetz and Paco Bertolani, said the finding could have implications for human evolution. Pruetz and Bertolani made the discovery at their research site in Fongoli, Senegal, between March 2005 and July 2006. “There were hints that this behaviour might occur, but it was one time at a different site,” said Jill Pruetz, assistant professor of anthropology at Iowa State University, US. Chimpanzees were observed jabbing the spears into hollow trunks or branches, over and over again. After the chimp removed the tool, it would frequently smell or lick it. 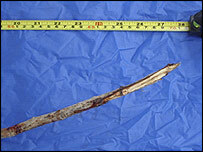 In the vast majority of cases, the chimps used the tools in the manner of a spear, not as probes. The researchers say they were using enough force to injure an animal that may have been hiding inside. However, they did not photograph the behaviour, or capture it on film. In one case, Pruetz and Bertolani, from the Leverhulme Centre for Human Evolutionary Studies in Cambridge, UK, witnessed a chimpanzee extract a bushbaby with a spear. In most cases, the Fongoli chimpanzees carried out four or more steps to manufacture spears for hunting. In all but one of the cases, chimps broke off a living branch to make their tool. They would then trim the side branches and leaves. In a number of cases, chimps also trimmed the ends of the branch and stripped it of bark. Some chimps also sharpened the tip of the tool with their teeth. 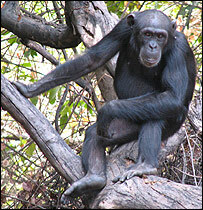 Adult males have long been regarded as the hunters in chimp groups. But the authors of the paper in Current Biology said females, particularly adolescent females, and young chimps in general were seen exhibiting this behaviour more frequently than adult males. “It’s classic in primates that when there is a new innovation, particularly in terms of tool use, the younger generations pick it up very quickly. The last ones to pick up are adults, mainly the males,” said Dr Pruetz, who led the National Geographic Society-funded project. This is because young chimps pick the skill up from their mothers, with whom they spend a lot of their time. “It’s a niche that males seem to ignore,” Dr Pruetz told BBC News. Many areas where chimpanzees live are also home to the red colobus monkey, which the chimps hunt. However, the Senegal site is lacking in this species, so chimps may have needed to adopt a new hunting strategy to catch a different prey – bushbaby. The authors conclude that their findings support a theory that females may have played a similarly important role in the evolution of tool technology among early humans. Sonraki Yazı Dört Ayak İyi, İki Ayak Daha İyi!